Infinity Engine is the third and final novel in the Transformation series, by bestselling science fiction author Neal Asher, following Dark Intelligence and War Factory. A man battles for his life, two AIs vie for supremacy and a civilization hangs in the balance . . .
Several forces now pursue rogue artificial intelligence Penny Royal, hungry for revenge or redemption. And the Brockle is the most dangerous of all. This criminal swarm-robot AI has escaped confinement and is upgrading itself, becoming ever more powerful in anticipation of a showdown. Events also escalate aboard the war factory. Here Thorvald Spear, alien prador, and an assassin drone struggle to stay alive, battling insane AIs and technology gone wild. Then the Weaver arrives - last remnant of a race that died out two million years ago. But what could it contribute to Penny Royal's tortuous plans? And beyond the war factory a black hole conceals a tantalizing secret which could destroy the Polity. As AIs, humans and prador clash at its boundary, will anything survive their explosive final confrontation? Every page of this novel works hard to drive the story forward and succeeds in delivering the culmination of the series. High concept stuff and confusing at times but ties up threads from earlier books. 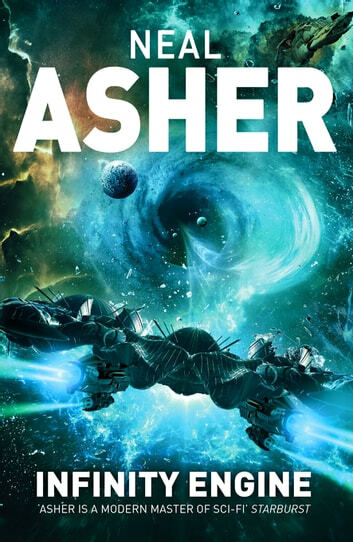 I am working my way through all of Asher's work, and I have enoyed this the most. It is a massive book and an excellent ending to this superb three-book series; set in the brilliant Polity universe.